The terms “quality control” and “quality assurance” are often used interchangeably to refer to ways of ensuring the quality of a service or product. The terms, however, have different meanings. Quality control was initially introduced during World War II when munitions were inspected and tested for defects after they were made. 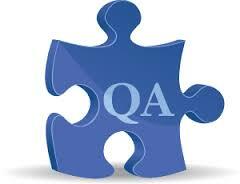 Today, quality assurance emphasizes catching defects before the final product is delivered. A quality assurance system is said to increase customer confidence and a company’s credibility, to improve work processes and efficiency, and to enable a company to better compete with others. All of these items are essential for a small, employee-owned business to succeed. While many companies have a separate department devoted to quality assurance, at ELS Inc., it is embedded in our corporate structure and philosophy. Quality starts at the highest level of management and flows down to the individuals that create the elements incorporated into the product. Individual acceptance of responsibility for the quality of the originator’s own product is an integral part of our corporate culture. We are committed to providing excellent products and services, with the highest quality, and for the best value. We strive for continued improvement with an experienced staff of professionals that help us achieve our goals and live our values.